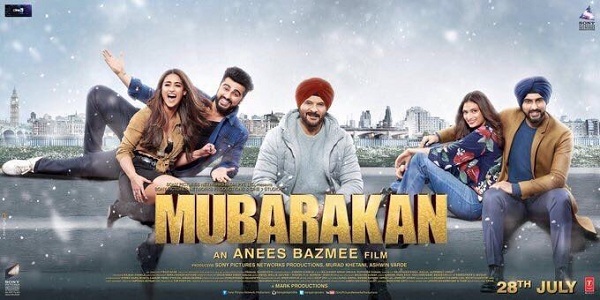 Mubarakan 2nd Saturday (9th Day) Box Office Collection Report. Huge Growth. Mubarakan has collected an approx 2 crore nett on 2nd Saturday (9th day) at box office. Thus, film hs registered a huge jump of around 90% from 2nd Friday. Film need further huge jump on 2nd Sunday (10th day) to carry its fight on ahead. Mubarakan total collection after 9 days is approx 38.7 crore nett. Film is all set to cross 40 crore nett today that is on day 10. Film is fighting hard to survive at box office and will need good 2nd and 3rd week. Film trending is good so far. Problem is film started slowly on opening Friday and it has played spoilsport for rest of the days. It is all about recovery now. Still film had trended well. Ideally after such a slow start on 1st Friday film needed excellent trending for two-three weeks. Film is honestly trying that. But because of big release in Jab Harry Met Sejal this week, screening of Mubarakan is reduced big time. Hence, potential of collection on a single day is not much. how much it needs to become semi hit? ?